Riviera del Sur is what happens when a classic cantina and a modern posh bar go to bed without protection. 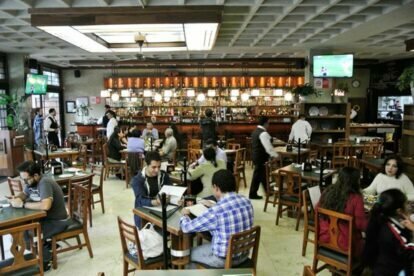 The place managed to preserve the best of both and has become one of the most popular spots for eating/having drinks in the Roma Norte neighbourhood. Riviera del Sur serves Mexican food, specifically dishes from de Yucatán peninsula area, like “cochinita pibil” (slow-cooked pork with orange juice, garlic and annatto seed adobo), “sopa de lima” (chicken and lime soup) or “frijol con puerco” (pork and beans stew). They have this huge and gorgeous bar filled with all kinds of booze, in case you are into cocktails. Personally, I like having a cold Victoria beer with an Herradura Blanco tequila as chaser to get me in the zone quickly ;). Usually, Riviera del Sur gets packed on weekends from 19:00 and on, so getting there early or making a reservation could be useful, especially if you are attending with a large group. What are the things you MUST try? 1. Taco de cochinita pibil. 2. Taco de lechón asado (slow-roasted suckling pig taco). 3. Pan de elote (corn bread served with vainilla ice cream).